Climb On Safely is the Boy Scouts of America's recommended procedure for conducting BSA climbing/rappelling activities at a natural site or a specifically designed facility such as a climbing wall or tower. 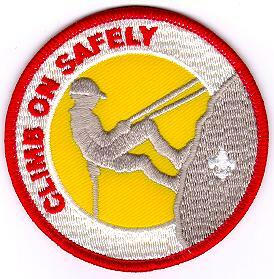 Although the BSA has an excellent safety record, there is inherent risk in climbing and rappelling. With proper management, that risk can be minimized. When a climber is 6 feet or more above the ground, nothing should be left to chance. Leaders should be aware that Climb On Safely is an orientation only and does not constitute training on how to climb or rappel. Young people today seek greater challenges, and climbing and rappelling offer a worthy challenge. The satisfaction of safely climbing a rock face is hard to top. While introduction of the Climbing merit badge in spring 1997 spurred interest in these activities through the BSA, the proliferation of climbing gyms and facilitates have also made climbing and rappelling readily available throughout the United States. This increased interest has made the BSA more aware of the inherent risks of climbing and rappelling. More accidents occur during unit rappelling than during council-managed climbing or rappelling, and more accidents have occurred while rappelling than climbing. Many climbing/rappelling accidents could be avoided by having qualified instruction from a conscientious adult who has the attention and respect of the youth entrusted to his or her care. Supervision by a caring adult who fully understands and appreciates the responsibility he or she assumes helps assure safety when youth engage in or prepare for climbing or rappelling. The adult supervisor's relationship with youth should reinforce the importance of following instructions. The adult leader in charge and the climbing instructor share this responsibility. The instructor is responsible for all procedures and for safely conducting the climbing/rappelling activity. The adult supervisor works cooperatively with the climbing/rappelling instructor and is responsible for all matters outside of the climbing/rappelling activity. A capable instructor has experience in teaching climbing/rappelling to youth, acknowledges personal limitations, and exercises good judgment in a variety of circumstances. The person who just spent four days of free-solo climbing on a sheer rock face may have technical skills but may lack teaching ability or the ability to empathize with youth who may be apprehensive about climbing. Leaders and instructors should also consult current literature on climbing and rappelling for additional guidance. The Outdoor Skills Instruction - Climbing/Rappelling manual, No. 33036, is the most authoritative guide currently available from the Boy Scouts of America. In the year 2000, the BSA plans to publish a comprehensive climbing manual that will replace the current OSI manual. Mountaineering: The Freedom of the Hills, sixth edition, edited by Don Graydon and Kurt Hanson, is a recommended reference for specific questions not covered in BSA literature. This book also covers lead climbing, snow and ice climbing, and other pursuits that are beyond the scope of BSA climbing/rappelling activities. These are not recommended activities for BSA units. Cub Scouts and Webelos Scouts are encouraged to engage in climbing in a controlled environment with close supervision by instructors who are knowledgeable about instructing this age group. Normally this means going to a climbing gym where the degree of difficulty is age-appropriate and the harnesses are size-appropriate for Cub Scouts. It is not recommended that Cub Scouts use climbing towers and walls in camp that have been designed for Boy Scout use. Qualified instruction is essential to conducting a safe climbing/rappelling activity. Some people who claim to be qualified or have had some experience with climbing or rappelling may lack sufficient knowledge to safely conduct these activities. For instance, some climbers with a lot of experience have repeated the same mistakes many times without learning correct procedures. All Climbing and rappelling must be supervised by a mature, conscientious adult at least 21 years of age who understand the risks inherent to these activities. This person knowingly accepts responsibility for the well-being and safety of the youth in his or her care., This adult supervisor is trained in and committed to compliance with the eight points of the BSA’s Climb On Safely procedure. One additional adult who is at least 18 years of age must also accompany the unit. Units with more than 10 youths in the same climbing/rappelling session must have an additional adult leader at least 18 years of age for each 10 additional youth participants, In other words, a group of 11 to 20 youths requires at least three adult leaders: a group of 21-30 youths would require four adult leaders, and so on. The adult supervisor is responsible for ensuring that someone in the group is currently certified in American Red Cross Standard First Aid and CPR (a 6 ½ hour course.). In addition, the two-hour module "First Aid—When Help is Delayed" is required. A course of equivalent length and content from another nationally recognized organization can be substituted. A higher level of certification such as emergency medical technician (EMT) licensed practical nurse (LPN), registered nurse (RN), and licensed health-care practitioner is also acceptable. The ARC’s Emergency Response, a 43 ½ hour course that includes CPR, is highly recommended. Each participant knows, understands, and respect the rules and procedures for safely climbing and repelling and has been oriented in Climb On Safely, All BSA members should respect and follow all instructions and rules of the climbing instructor. The applicable rules should be presented and learned prior to the outing and should be reviewed for all participants before climbing or rappelling begins. When participants know the reasons for rules and procedures, they are more likely to follow them The climbing instructor must be strict and fair, showing no favoritism. The BSA limits unit climbing to top roping. A separate belay safety rope with a separate anchor system is used for all BSA units rappelling activities. A UIAA- and/or ASTM-approved climbing helmet must be worn during all BSA climbing/rappelling activities. Require evidence of fitness for the climbing/rappelling activity with at least a current BSA Personal Health and medical Record, class 1 - a complete health history from a parent of legal guardian. The adult supervisor should adapt all supervision, discipline, and precautions to anticipate any potential risks associated with individual health conditions. If a significant health condition is present, an examination by as licensed health-care practitioner should be required by the adult supervisor before permitting participation in climbing or rappelling. The adult supervisor should inform the climbing/rappelling instructor about each participant’s medical conditions. Records must be kept on the use and stresses (the number of hard falls) on each item of equipment, which must be specifically designed for climbing/rappelling, Outside providers should be asked if they are aware of any stresses that he been put on their equipment,. Any rope or webbing that has been subjected to more than three hard falls or that is four years old (whatever its use) must not be used. Refer to the Project COPE manual, No. 34371, concerning records that must be kept and be made available even by outside providers. Enlist the help of a qualified climbing/rappelling instructor. Be sure the instructor has a topographic map of the area being used and obtains a current weather report for the area before the group's departure.